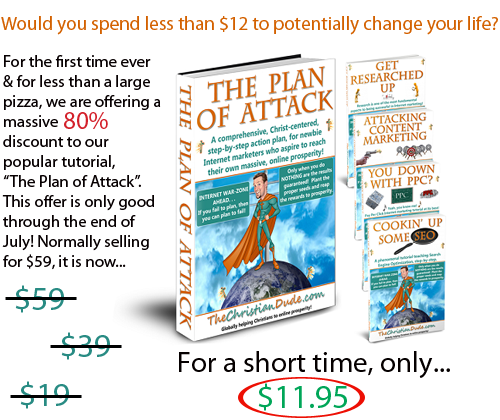 Plus, a huge discount on The Plan of Attack (only $11.95, normally $59), and our Facebook tutorial, “Facebook Marketing Madness”, for FREE (normally $17)! So, our full access membership to theChristiandude.com is truly a phenomenal proposition. You’ve probably heard that we are the best online, Christian business opportunity in existence, as well as being a “prosperity learning center” for aspiring Christian Internet marketer wannabe’s. WELL, did you know you can also use our site to simply learn how to drive massive amounts of web traffic and visitors to your existing business website, web page, or Christian business, ministry, band, or similarly? At the same time, many people are not quite ready to jump into paying for a membership, despite our very small cost involved. So, we happily extend to you our FREE membership level! What do you get by being a free member of our site? Well, we will send absolutely and 100% FREE products such as e-books, video tutorials, and plugins or software, as well as Christ-centered tips, advice, and encouragement on a regular basis. Bonus #2: Receive this free immediately! Bonus #3: Free products and tutorials 3 to 4 times a month, plus Christ-centered tips, encouragement, and content on a regular and ongoing basis! So, a pretty good start, right? We have gotten many e-mails and private Facebook messages asking the question: “So, Dude… I am not really ‘getting’ this whole make money online thing. How exactly does it work, and what are you teaching?” So, please allow us to explain. “Affiliate marketing” is a billion dollar per year industry. There are tens of thousands of people all over the world who simply drive traffic to other people’s offers or websites, and quite simply, they prosper from doing so. We teach people (through our resource center at our membership site) varying ways to market products and drive products to those offers. Yet, there simply aren’t enough marketers to meet the massive demand by people and companies wanting help getting their products sold! There are literally tens of thousands of companies who pay you simply to deliver website traffic to their product or offer, and there are “info-products” such as e-books, plug-ins, software, video tutorials, Internet marketing tutorials, and similarly, that all pay you a commission typically ranging from 40% to a whopping 80% of the sale! Other companies might pay you for leads… so for example, say you send someone to Proactiv’s website (the skin care and acne product). They might pay you $20 simply for someone filling out their form for a free trial of their product. This is known as a CPA offer, or “cost per action”. The opportunities of making money online are boundless. So, when all is said and done we teach online prosperity from a three-prong approach. 1- First, we teach you how to make your first dollar online through our 30 day task-based lesson plan, “The Plan of Attack”. This walks you through the process step-by-step, and through actionable content and tasks, to making your first dollar online as an affiliate and Internet marketer. Anyone getting started in Internet marketing needs to start as an affiliate marketer. They are taught how to drive massive traffic to other people’s offers, while prospering from each sale or action. Alternatively, we also teach you how to prosper from your own blog or niche topic industry, through using Google’s advertising platform, wherein Google pays you on a PPC (pay per click) basis by placing their ads on your website or blog. So, you start as an affiliate marketer, where there are already thousands of marketers all over the world making six figures a year and more simply by marketing other people’s products. In fact, though the exception and not the rule, there are countless other million dollar per year earners, with affiliate marketing as their sole income! 2- Once you have become an expert in affiliate marketing, you become a product creator. You are taught to create your own e-book, video tutorial series, or even software or plug-in by either creating those items through the expertise you’ve garnered as an affiliate and Internet marketer, or finding ways to outsource those projects for dirt cheap. Did you know there are tens of thousands of people waiting to be contacted by you, in hopes of doing a job for you as a freelancer? These people are located in the US, Canada, India, the Philippines, Russia, and beyond! We teach you where to find these individuals. Becoming a product creator is when many people’s income take that step to “the next level”. We have all the resources you need, from video tutorials on expert copywriting, to product launch, to lessons on creating video tutorial products, and much more. 3- Finally, once you have established yourself as an authority in your niche or industry, you become either a membership site creator and charge people for those memberships, or you become a personal coach and mentor, helping people to thrive in the niche or industry you have chosen. This is where high volume sales are replaced by less frequent but higher-dollar transactions. This is the main income source for most of the milion dollar per year “guru’s”. It’s as easy as that! Now, keep in mind… this is simple as in the process being simple, but it is not easy. Easy insinuates it requires little to no effort. The fact is, this is very real, but it does require diligence, effort, and commitment. If you are willing to partake in those 3 things however, you will prosper online! Your biggest problem though? NOT KNOWING WHERE TO START! All you have to do is join theChristiandude.com as a FREE member, and we will send you an e-mail shortly thereafter, with a link to buy our $59 Plan of Attack for the ridiculously low price of $11.95. Stay with us for at least a month? You will receive our Facebook Marketing madness guide for free as well. Please keep in mind, this is a very limited offer! We will only run this through the end of July or so, and if the response is strong enough, we reserve the right to pull the offer at any time.